A new meat substitute is hitting the shelves at Tesco as the supermarket responds to growing demand for plant-based foods. In the last year the retailer has seen demand for frozen meat-free foods shoot up by more than 70 per cent, while sales of chilled vegetarian ready meals and meat substitutes have risen by 30 per cent. The Oumph! range, which is already proving popular with shoppers in Sweden and Norway, will go on sale at nearly 400 Tesco stores across the UK, retailing at £3.39 per pack. In January the supermarket launched its Wicked Kitchen range of vegan meals, created by its new director of plant-based food innovation Derek Sarno. The thinking behind the range was to give shoppers more plant-based food choices, and it was Sarno who recommended that Tesco stock Oumph! 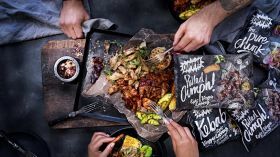 “We’re seeing massive demand for plant-based food and are thrilled to be unleashing the mighty flavour of plants, making eating meat-free easy and accessible like never before,” he said. Oumph! contains soy beans and organic herb and spice mixes. It's free from gluten, dairy and nuts and is versatile and easy to cook, according to Tesco. The supermarket added that it is high in protein and fibre and a source of iron and folic acid. The Oumph! products to be stocked at Tesco, which are made predominantly of soy beans, include the unseasoned Oumph! The Chunk; Pulled Oumph! which comes in a BBQ sauce; and the Oumph! Kebab, which comes in strips seasoned with a classic kebab spice mix. In both Sweden and Norway the meat substitute has been named a retail ‘product of the year’ since it was launched in Sweden in 2015.